I know you hear me complaining. I know you hear me when I sigh and say the laundry in this house never seems to end. It's true, you know, it doesn't. It started out small. Little socks for little feet. Tiny shirts for my two little boys. Blueberry stains, applesauce spots, orange juice spills. As the years moved on, the hamper seemed to fill faster and faster. Bigger socks for bigger feet. Larger shirts for bigger boys. Grass stains, ketchup spots, grape juice spills. Before I knew it you had both grown so much that you needed your own hampers. Soccer jerseys, baseball pants, ski clothes. Different clothes for my boys who were changing and growing right before my eyes. The truth is that behind my complaining is a mom who is desperately trying to remember the smell of your baby pajamas. I remember folding rompers and bibs. I remember losing baby sock after baby sock because there was no way something so tiny was surviving the sock monster that clearly resides in our dryer. I remember cleaning skinned knees and kissing boo boos, then hoping that the bloody knee spot would come out of your new cute toddler pants. I cheer you on at your baseball games knowing full well that the hamper will be full of grass stained pants, ketchup stained shirts, and smelly socks. Sure I roll my eyes, but the truth is I will miss this. The other day as I grabbed all of your clothes out of the dryer I had a flash back to the days of the two of you lying in the grass, waiting for dusk so that you could catch fireflies. I remembered the smell of your clothes after a full day outside. I remembered folding the clothes of my two small boys and feeling happy and content about the day. The truth is one day I will open that dryer and it will no longer have your socks, or your shirts for me to fold. The two of you are already helping so much with your own laundry, but late at night when you have both drifted off to sleep, I sigh and open the dryer. I sit and I fold your baseball uniforms. I look at the piles and I know that one day they will no longer be there. I look at the piles and I see the both of you. I see your hobbies. I see your favorite shirt that I beg you to stop wearing every other day. I see your pants that you are about to outgrow. I see your sweatshirt you begged for on vacation. I see you. I see who you are, and I remember who you were. 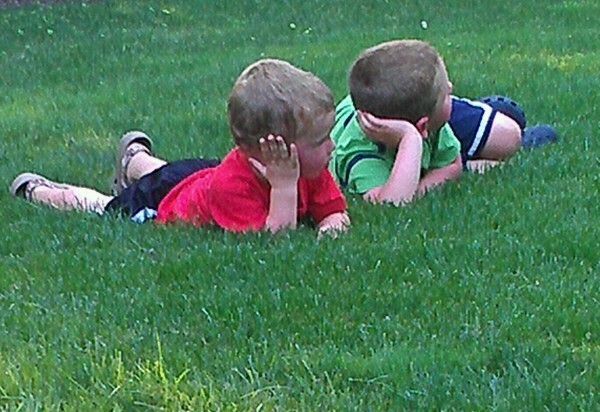 As I drift off to sleep I see two little boys lying in the grass waiting for fireflies. Jennifer Lizza is a wife, mom, writer, runner, sleep enthusiast, and blogger at Outsmarted Mommy. Her two boys outsmart her daily, although in her defense it could be the lack of sleep.